“Get your squeeze on boys and girls! We should have been on the express spray fifteen fruit-seeds ago!” bellowed OJ Orange. “We’re coming pop! Don’t skin your peel!” Cit yelled back to his Father. 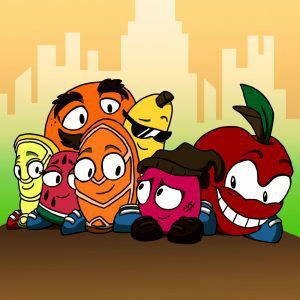 After patiently waiting three whole weeks, the Lil’Fruityz were finally off to Citron City to support their best bud as he competed against some of the best fruit-letes around! Citron, still overflowing with excitement, was preparing to juice the competition dry! With a positive attitude, confidence, and the fruitiest fan section in all of Citron City, Cit had no doubt he would achieve his goal to finish as one of the fruitiest fruit juicers in the competition. Although many fruits would be nervous to be in Cit’s position, Cit wasn’t just some ordinary fruit. He was driven, he was fearless, and he had always loved competing with his tangy citrus juice. Not only does Cit stand for passion and pride, but he also represents a positive influence for all of the Lil’Fruityz. In fact, on a typical summer night, Cit enjoyed sitting on the roof of his fruit house star gazing and dreaming… dreaming of the only dream that ever entered his mind; to one day compete in the fruit-lympics with all his friends. Piling into OJ Orange’s fruit-cedes, all of the Lil’Fruityz securely fastened themselves into their seats. With all the Fruityz traveling in one fruit-mobile, there was no telling what could have happened on that ride to Citron City! Bizzy Bananza was especially thrilled to support Cit in the competition. With Bizzy’s abundance of lyrical talent, Cit knew he could count on him to vocalize the fan section. He even began to chant a little bit on the car ride! “Letsss-gooo-Cittt!!! (Squeeze-Squeeze) (Squeeze-Squeeze-Squeeze) Letsss gooo Cittt!!! (Squeeze-Squeeze) (Squeeze-Squeeze-Squeeze)” chanted Bizzy with pride. “Are you sure you’re not nervous Cit?” asked Twist in concern for his brother. “I’m sure little bro; I don’t let the pressure get to me because if I do… it will squeeze my confidence harder than I can squeeze a drop of juice” Replied Cit. As the Lil’Fruityz were wrapping up a very intense game of guess that fruit, they noticed the tunnel they had been under was nearing an end. “This JUICY is FEELING LOOSY GOOSEY!” Ap’Zal exclaimed as all the Lil’Fruityz became overwhelmed by the bright lights and sheer juiciness of Citron City! The moment they had been waiting for since the “Juicy Escape” caper at Main Squeeze Elementary had finally arrived. As they were suddenly emerged in a series of colorful lights and tall building structures, the Fruityz were amazed at the sight of the city. The level of excitement for the competition was now at an extreme high. The fruits were extremely eager for OJ to park the FUV so they could walk the city streets. Trying his best to find a parking spot, OJ eventually found a small parking garage that he could leave his fruit-mobile in. As they walked along the big city sidewalk, the Fruityz were captivated by the beautiful displays of the night life. It was amazing to the fruits! It seemed that every fruit that walked by had some place important to be. They had never witnessed such a chaotic scene taking place before their very eyes. The travelers of the sidewalk weren’t the most mannered fruits; many were shoving and calling other fruits sour names. OJ didn’t like the fact that this behavior was taking place in front of the fruits, but he knew he couldn’t protect them from every reality the city had to offer. Abruptly out of nowhere, a large grapefruit plowed into Ap’Zal! “Watch it apple!” shouted the angered grapefruit. “Hey! He’s just a young fruit! So you watch it!” defended OJ Orange. The puzzled look on OJ’s face turned into panic! He figured he must have left the directions at home. Now, OJ was faced with his toughest challenge of the day, how to tell the fruits he had no idea how to get to the competition. Once again OJ Orange’s face made a drastic change. It went from panic, to sorrow. OJ had to muster up the courage to tell the Lil’ Fruityz he had no idea how to get there. He knew the look on Cit’s face would be heart-breaking, he also knew he had to be honest and forth coming about the situation. “Kids, I won’t lie to you. We’re lost” Voiced OJ. “Lost? Pop, you said you used to live here” said Cit. “Well that was a long-long time ago Citrus. And I didn’t live downtown, I lived uptown, where there were friendly fruits all around instead of these grapefruit goofballs that are juicing around here!” replied OJ. “Dad, are we in trouble?” politely asked Twist. “Trouble? Ha! No son, were going to be just fine” assured OJ. Gazing up at the skyline, Cit focused on a tall building that displayed the current time. “What time does the competition start?” curiously asked Cit. “Around seven O’clock, we still have plenty of time!” responded OJ. 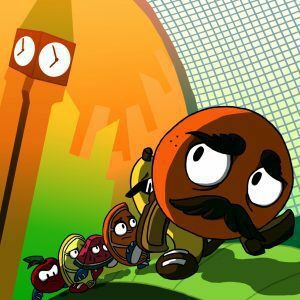 As they wandered up and down the bright city blocks of Citron City, the hour grew closer to seven O’ clock. “Come on! Run fruits!” shouted OJ. “Dad! We don’t know where you’re running to!” yelled a tired Twist. “Even if we did, we still wouldn’t have enough time. According to the big clock on that building, we’re now about twenty squeezes too late ,” sighed Cit. competition today. Nothing was said for a few moments… Then Cit, being the quality juice he is, simply smiled. “Hey, it’s not like there won’t be other contests,” Cit stated as he consoled Wanda. “I know your disappointed son but you need to understand that there is going to be regular occasions where plans don’t necessarily work out the way you would like. We had no control in this Cit; but you just have to believe that there is fair reasoning behind it. Never allow disappointment to be your excuse son. All we have room for is 100% juice, excuses are just going to have to catch a ride with the angry grapefruits” joined OJ. “I’ll never give up Pop” said Cit proudly. “And that’s what makes you my son!” OJ Orange said triumphantly. 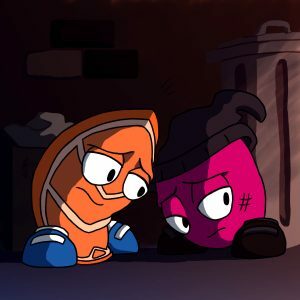 After a couple pats on the back from his fellow fruits, Cit and the Fruityz began to make their way back to OJ’s FUV. The juices were already planning Cit’s next competition for the “Punch Bowl” trophy as they stumbled upon a sad sight. Resting in a dirty alley, a young plum tossed and turned over a pile of dirty peels. “That poor fruit!” whispered Wanda. “What can we do?” asked Twist. Attempting to remember where he had parked his fruit-mobile, OJ Orange had already squeezed down the street and was unable to help them in this situation. “Well, we need to ask him if he’s okay,” convinced Cit. Cit made his way towards the battered and bruised fruit, and as he got within sneaker distance, he began to gently nudge the fruit awake. “WAKE UP LITTLE FRUIT DUDE!! !” screeched Ap’Zal to the sleeping fruit! The plum was so startled that he squeezed his way out of that alley at record pace. “Come back little plum! We want to help you!” yelled Cit. The next thing that Twist, Bizzy, Wanda, and Ap’Zal saw could only be described as a “bolt of orange!” It was Cit! He was already right behind the frightened plum fruit-whispering him to ease his nerves. The young plum began to realize that he wasn’t in any danger, and slowly came to a complete stop. Now wedge-to-wedge, Cit looked at the plum and noticed his torn seams and rotting outer layer. In that very moment, Cit realized that this abandoned plum needed his help. “Are you hurt?” asked Cit to the shaking plumb. Although the plumb didn’t respond, Cit understood that he was okay by the shake of his head. “Do you have a name little fruit?” asked Cit. “I’m thirsty!” cried the plum. “Well, it’s nice to meet you Thirsty, I’m Citrus” replied Cit. “NO! I’m really THIRSTY! I haven’t had any juice all day long” said the plum. Cit was shocked to hear that a fruit had gone all day without healthy nutrition. Watching the desperate plum swing an empty glass back and fourth, Cit suddenly remembered the words of wisdom his father spoke earlier that night. He then realized his father was right, things don’t always go according to plan. Sometimes you plan on squeezing a terrifically tangy juice to make mouths water, and instead, you squeeze a surprisingly sweet juice to tickle the tongue! It wasn’t the juice you planned on squeezing, but it’s still 100% pure, 100% quality juice, pesticide free! The orange wedge then looked up at the magnificence that defined Citron City, the name the locals new the city by, The City of Lights. The cotton candy pinks swirled with the aqua blues in such a way you could almost smell sugar in the air… and still kept harmony with the luscious sorbet oranges and greens. 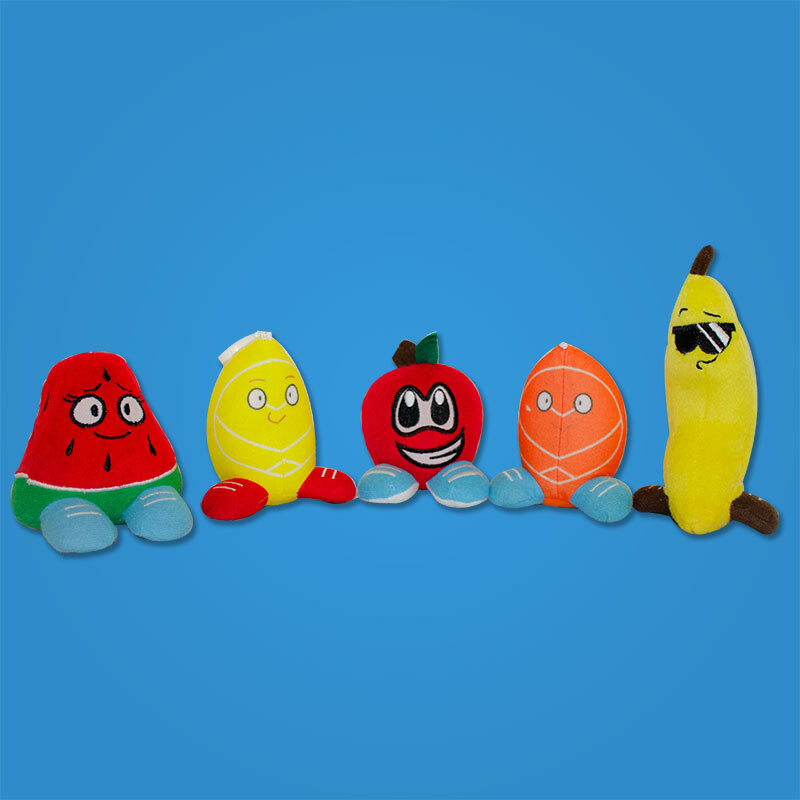 Just as all of the lights were coming together, Cit saw his four, favorite Lil’ Fruityz running towards him! Wanda gave Cit the sweetest hug, while Bizzy smoothly approached Cit and said,” Cit Sourz has some juicy powers.” as Bizzy began to grin from ear to ear. Twist gave his little brother the concerned up/down look, and after Twist finished his scan of his brother he said,” You’ve still got a peel on your head and both sneakers on your feet lil bro, I knew you would stay juicy!” As soon as Twist went to give his lil bro a hug,” AP”ZALLLLLLL BOMBBBBBB!” Mr. Red Delicious yelled as he Ap’Zal Bombed Cit right to the ground! The Lil’ Fruityz were reunited! They all felt immediate relief, but they weren’t quite out of the blender yet. They still had a new friend with an empty juice glass. Before anyone said a word, Cit was starting his juice stretches. He had that juicy look in his eye, he was ready. He turned to his new friend and said,” I hope you’re thirsty Plum! I’m juicing 100% pure!! The plum quietly replied,’ my name is Peter. Peter Plum. “Well you’re in luck little fruit, I came here today for 2 reasons!! And with amazingly good timing for once, Ap’Zal Bottumz yells,” WE CAME HERE TO GET LOOSE AND JUICE!! AND WE”RE ALREADY LOOSEY GOOSEY AND THIRSTY FOR SOME JUICY!” …now give me that cup.” Cit says with pride. “You are about to taste 100% pure, juicy deliciousness! “And I kicked that fruit-ball so hard it almost broke thru the fruit cup!” OJ Orange exclaimed as he was wrapping up his favorite juice-ball story that he always told the fruits. “My team nicknamed me the golden toe after that game!” the orange proudly said as he unlocked the F.U.V. Remember, fruitbelts save lives,” OJ stated as he turned to make sure the fruits were buckling up. At that moment, OJ Orange became the first ever white orange! The site was so alarming, two of Citron City’s finest Apri-cops immediately juiced over to the panicked OJ Orange. “Slow breaths,” they both repeated. 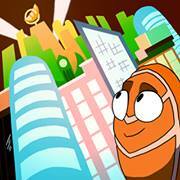 Appearing amongst the lights, OJ Orange was able to see a banana shadow wearing shades! Sure enough, the Fruitastic B.I.Z. was leading the way as all the Lil Fruityz were juicin out of their skins about what a great day they had! They gained something much more valuable then a trophy, they gained a friend. Peter Plum. Now given his new friendship, Cit had no choice but to honor the fruit code; fruits don’t let other fruits go dry! With a prime glass of citrus blast in one hand, Peter Plum was looking much better. He even smiled a few times. He was very grateful for all the Lil’ Fruityz had done for him. He was especially thankful to Citrus Citron, his own personal hero of Citron City. Peter was quiet for a few minutes, then a smile came over his face. Almost as if a light turned on. He walked right up to Cit, peel to peel and said ,” Hey Cit, 100% juice no excuse!